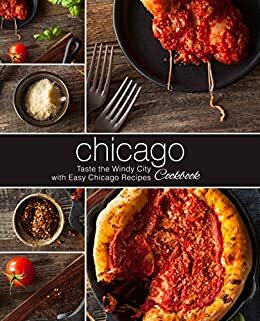 Chicago Cookbook: Taste the Windy City with Easy Chicago Recipes - Kindle edition by BookSumo Press. Cookbooks, Food & Wine Kindle eBooks @ Amazon.com. Get your copy of the best and most unique Chicago recipes from BookSumo Press! BookSumo Press is a publisher of unique, easy, and healthy cookbooks. Our cookbooks span all topics and all subjects. If you want a deep dive into the possibilities of cooking with any type of ingredient. Then BookSumo Press is your go to place for robust yet simple and delicious cookbooks and recipes. Whether you are looking for great tasting pressure cooker recipes or authentic ethic and cultural food. BookSumo Press has a delicious and easy cookbook for you. With simple ingredients, and even simpler step-by-step instructions BookSumo cookbooks get everyone in the kitchen chefing delicious meals. BookSumo is an independent publisher of books operating in the beautiful Garden State (NJ) and our team of food lovers are here to teach, eat, and be merry! This book starts out with free ebook offers, about the author and intro about cooking effortlessly. Table of contents broken up by main meat source. List of common abbreviations. Each recipe starts with a title, list of ingredients which you should be able to substitute for your healthier dietary needs: low sodium, low sugar and low fat products along with fresh produce rather than canned. Directions are given. Nutritional information has calories, fat-NOT broken up into good or bad, cholesterol, sodium, carbs and protein for a 2000 calorie diet. Servings and prep, total times are included. There are no pictures of the dish. There are photos of the area throughout the book-doesn't state where they are taken. 1.0 out of 5 starsauthentic? So being from ChicagoI found this book to be a joke. I'm certain that authentic Italian Beef does not start with a couple of cans of unknown broth & powered italian dressing in a crockpot! Seriously! Do yourself a favor and look elsewhere if you are serious about Chicago cooking!